Prof. Dr. Rati Ram Sharma, D.Sc., Ph.D. (London), M.D.(M.A. ), M.Sc., F.I.A.M.P., M.A.M.S., Prof. & Head (retired), Dept. of Biophysics with Nuclear Medicine, Postgraduate Institute of Medical Education & Research, Chandigarh was born on 1 November 1931 in the village Kalupura, Dist. Gautam Budh Nagar, UP, India. F. Jagan Nath Prasad, m. Champa Devi, w. Shakuntala, s. Mgr. Rajiv (m. to: Anjula), d. Sushma (m. to: Dr. Ashok), Dr. Pratima (m. to: Er. Manoj). Educated at Jaunchana, Jhajar, Meerut, and London. Got double promotions from II to III and VII to VIII classes. Received four merit scholarships from VII to MSc. Discovered the formula n(n+1)/2 for the sum of n natural numbers in VII class, which was later taught in XI. He took all round training at the Hammer Smith Hospital , London in the use of radioisotopes for clinical diagnoses, therapy and research. On return in April, 1969, he organised the Nuclear Medicine facilities at PGI, Chandigarh for teaching, diagnosis, therapy & research under the Biophysics Department and headed the same till 1989. He completed the work and writing of his Ph.D. (London) thesis in seven months (June through December 1968), after approval of the thesis plan, by solving three outstanding problems in alpha and theta brain wave states. He developed a Unified Theory of stationary (gamma camera) and moving radioisotope scanners. His guide Prof. J.F.Fowler of the Royal Postgraduate Medical School, London, certified thus "During this work he showed himself to be exceptional in his intellectual power. His contributions to the subject of quantitative radioisotope scanning are original, important and represent several steps forward in the subject. He also demonstrated an enormous capacity for hard work, and the ability to argue scientific cases cogently and energetically. He is definitely one of the brightest physicists working in Medical Physics anywhere in the world....."
A past President, Indian Academy of Medical Physics and Chairman, Society of Nuclear Medicine (India), he contested 1990-Physics Nobel Laureates' claim of "revealing" noncomposite elementary quarks from his Unified Physical Theory already published as a book. His predicted compositeness of quarks was later supported by experiments in 1991. His prediction that no Fermion can be neutral is supported by the observed neutron's negative Electric Dipole Moment agreeing with his theory. He is the past President, Association for Scientific Research in Homoeopathy and also chief Editor, Journal of Scientific Homoeopathy and Journal of Homoeopathy of Northern India. To elucidate the science of Homoeopathy he proposed three new sciences of Inductive Chemistry, Xenobiology & Inductoxenopathy. For these researches he got the International Albert Schweitzer prize, whose recognition scope is wider than the Nobel Prize in Medicine, for which also he was nominated in 1996. He has proposed a new Theory of Non-expanding Universe and a new molecular theory of non-Darwinian intraspecies evolution. The present man has evolved from, not the ape but the molecular through zygotic and primitive man. He has been greatly benefited from his yoga practices and ability to acquire alpha and theta brain wave states at will for creative thinking and solving problems. He is the initiator of Navayurveda and Aanad Yoga. He has authored over 200 research communications and eight books. He received the N.D.R.I., Karnal's Republic Day Award 26 Jan'64. New Hope Seekers Society, Dehradun recognized on 12 Jan'08 his contributions to Med. Phys. & Nucl. Med. with Nation Builders Award 2007. He has guided several PhD, MD & MS theses. Other theories proposed include Sharma Theory/Unified Theory, Principle of Null Action, Molecular Intelligence, Molecular Homoeopathy, Gene inclusion & Gene exclusion principles, Hook's law mediated nuclear force, unified basic Force/ Field Gravitoelectromagnetic, Symbiosis of Science & Philosophy. Prof. Dr. Rati Ram Sharma, D.Sc., Ph.D. (London), M.D. (M.A. 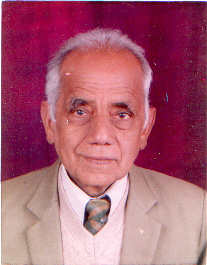 ), M.Sc., M.A.M.S., F.I.A.M.P., is Professor & Head (retired 1991), Dept. of Biophysics (with Nuclear Medicine), Postgraduate Institute of Medical Education & Research, Chandigarh, India; Present Res. address: #615, Sector 10, Panchkula-134113, Haryana, India; Phones: (0091-172)-2563949/4657615; emails: rrjss615@gmail.com, drratiramsharma@yahoo.co.in; websites: http://www.physicsrevolution.com/, http://www.sharma-upt.com/. He can assume alpha & theta brain wave states at will as tested by Dr. Almer Green, past Director, Menninger Foundation, USA. Thereby completed the work & writing of Ph.D.(London) thesis in 7 months (June thru Dec' 68) after plan approval. His guide Prof. J.F. Fowler certified him as ?definitely one of the brightest physicists working in Medical Physics anywhere in the world?. He did B.Sc. (1952) and M.Sc. (Phys., 1954) of Agra Univ. from Meerut College. Got allround training in Nuclear Medicine at Hammersmith Hospital, London and started it for teaching, diagnosis, therapy & research at PGI in April 1969. Past President, Indian Acad. of Med. Phys., Soc. of Nuclear Med, (India), Assoc. for Scient. Res. in Homoeopathy and Chief Editor, J. of Homoeopathy of North India. He contested the 1990 Physics Nobel Laureates' claim of revealing non-composite quarks; compositeness of quarks predicted by him was experimentally confirmed in 1991. With his new Theory of Non-expanding Universe contested the basis of 2006 Physics Nobel Prize, supporting the not provable Big Bag theory. Observed Neutron's negative Electric Dipole Moment agrees with that calculated from his theory, supporting his prediction that no Fermion is neutral. His controlled drug trials on human patients, rats and mice established the efficacy of the high potency homoeomedicines with no molecule of the original drug, removing the perennial impasse created by Avogadro's law. To elucidate the science of Homoeopathy he proposed 3 new sciences of Inductive Chemistry, Xenobiology & Inductoxenopathy, also Navayurveda: a judicious mix of Homoeopathy, Allopathy & Yoga. For 1984-book Molecular Homoeopathy & these researches the Open Internl. Univ. for Complementary Med. awarded him D.Sc., M.D. (M.A.) and the 1989-Albert Schweitzer prize, also nominated him for the Nobel Prize in Medicine in 1996. He received the N. D. R. I., Karnal's Republic Day award on 26Jan'64. New Hope Seekers Society, Dehradun recognized on 12 Jan '08 his contributions to Med. Phys. & Nucl. Med. with Nation Builders Award 2007. In his new theory of non-Darwinian intra-species evolution man has evolved from, not the ape but the molecular through zygotic and primitive man. He has co-guided several PhD, MD & MS theses and authored over 200 original communications and 8 books. Other theories proposed include Sharma Theory/Unified Theory, Principle of Null Action, Molecular Intelligence, Molecular Homoeopathy, Non-Darwinian Intraspecies Evolution, Gene inclusion & gene exclusion principles, Hook's law mediated nuclear force, unified basic force/field Gravitoelectromagnetic, symbiosis of Science & Philosophy, new Aanand Yoga.